Part of the Classic singles series. This recreated with digital vector art and scaled up to large format. 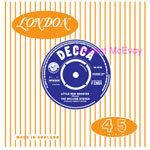 These limited editions are approved by Decca Records.